Capitalism has lifted millions out of poverty, transforming living standards and creating prosperity on a breathtaking scale. And yet, capitalism is unloved. Voices compete to point out the flaws in the system that allow increasingly powerful elites to grab an ever larger share of our collective wealth. In this incisive, clear-sighted guide, award-winning Financial Times journalist John Plender explores the paradoxes and pitfalls inherent in this extraordinarily dynamic mechanism – and in our attitudes to it. 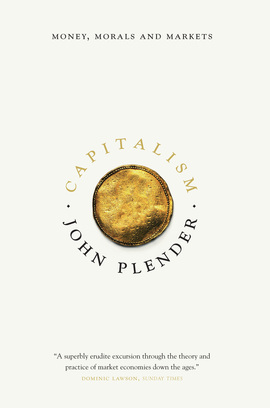 Taking us on a journey from the Venetian merchants of the Renaissance to the gleaming temples of commerce in 21st-century Canary Wharf, Plender shows us our economic creation through the eyes of philosophers, novelists, poets, artists and divines. Along the way, he delves into the ethics of debt; reveals the truth about the unashamedly materialistic artistic giants who pioneered copyrighting; and traces the path of our instinctive conviction that entrepreneurs are greedy, unethical opportunists, while manufacturing is innately virtuous. Thoughtful, eloquent and above all compelling, Capitalism is a remarkable contribution to the enduring debate.